In Event Horizon, thirty-one life-size body forms of the artist cast in iron and fiberglass will inhabit the pathways and sidewalks of historic Madison Square Park, as well as the rooftops of the many architectural treasures that populate New York’s vibrant Flatiron District. 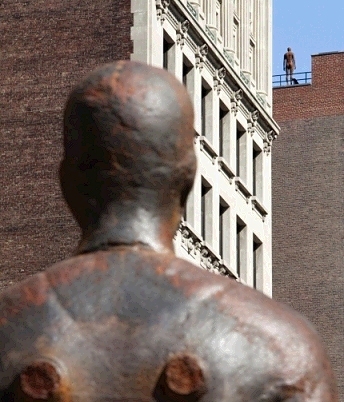 Event Horizon marks Gormley’s United States public art debut — a milestone for an artist whose work has garnered worldwide acclaim over the past 25 years. Antony Gormley. Event Horizon. Bilder. Videos.